Christmas is a very special celebration for Ukrainians. Many traditions and rituals are observed, and each aspect of Christmas has a special meaning. Everyone is wearing their best clothes and the house has been cleaned top to bottom for the day, although all spider webs are left untouched. Legends about the generosity of spiders at Christmas mean they are not to be disturbed. What else is going on in the house? Didukh is the Ukrainian name for the wheat sheaf brought into the house on Christmas Eve. It is home for spirits of the ancestors for the season and is made of the very best wheat of the harvest. Icons are a centerpiece of traditional Ukrainian homes and are usually decorated with rushnyky (embroidered or woven ritual towels). 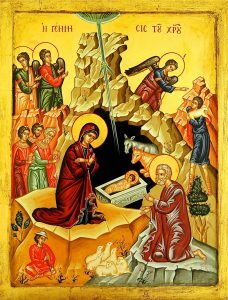 Nativity icons have special significance since they represent beliefs surrounding the birth of Jesus. There are many dishes on the table. Usually twelve meatless dishes are served during the Christmas Eve Supper or Sviatyi Vechir (Holy Supper). The food vary from region to region and from family to family, the most common include: kutia (wheat and poppy seed dish), borshch (beet soup), varenyky (perogies), kolachi (braided bread). The dishes are all meatless due to the belief that a Lenten meal cleanses the soul in preparation to welcome the Christ child into ones heart and home. There are two tablecloths on the table. The plain bottom one is for the visiting spirits of the dead, while the top one is where the family eats. The blessing of straw is placed between the tablecloths and on the floor under the table to represent the manger. Sometimes candy and coins are hidden in the straw for the children to find after the meal. Gifts are received weeks earlier on St. Nicholas Day. The entire meal is prepared that day on a large oven, or pich; none of the food is prepared in advance. When the first star appears in the sky, like it did that first Holy Night when Christ was born, the Holy Eve. Once it is seen, the meal may start, but not a moment sooner! Supper begins with the lighting of a candle. Caroling is a very important tradition in Ukraine. It is usually done between Christmas and Malanka (New Year’s Eve in accordance with the Julian calendar). Koliadky are sung for Christmas and shchedrivky were sung around Malanka. The lead caroler carries a star, which is elaborately decorated for the occasion. If you listen closely, you may be able to hear a choir singing right now!